This picture evokes the grace and beauty–and heat– of Kenya. 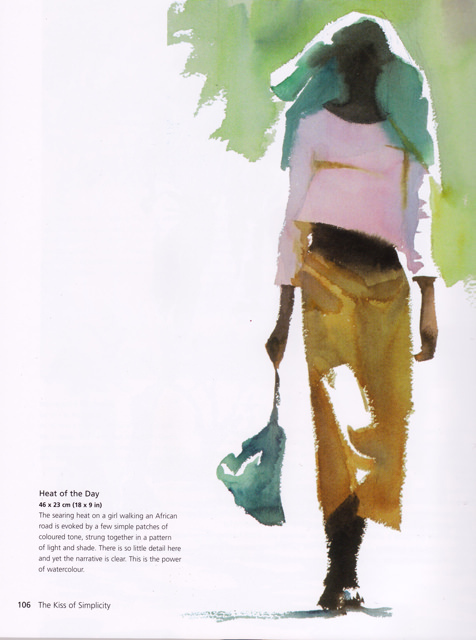 I love Hazel Soan’s work, her use of the white page, her dry brush strokes and her light suggestive touch. I leave tomorrow night, so I’ve been doing all the last minute things today. 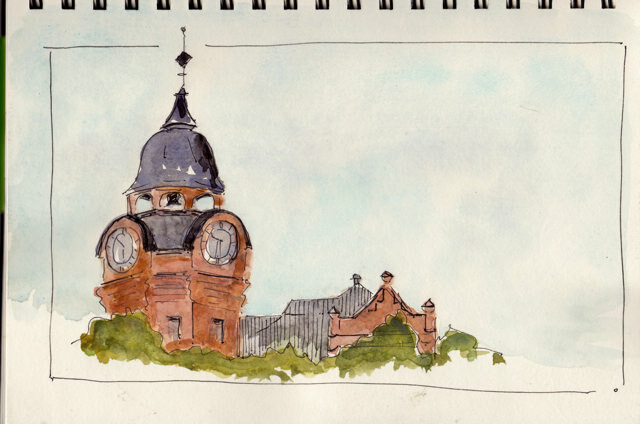 But I still took time to sit by the river in my car and sketch the city hall. It was a perfect bright day, the river was frozen, the sun glinting on the shards of ice. I didn’t take long, about 1/2 an hour. I just had time for the tower and you might say, why bother, but sketching for me now has become like a pressing a reset button. It’s essential. Everything leaves my mind and my hand and eyes take over for a little while. The chattering left brain steps back. Thank you for all your comments. I’ll be back here when I get connected in Kenya. It may take a few days. 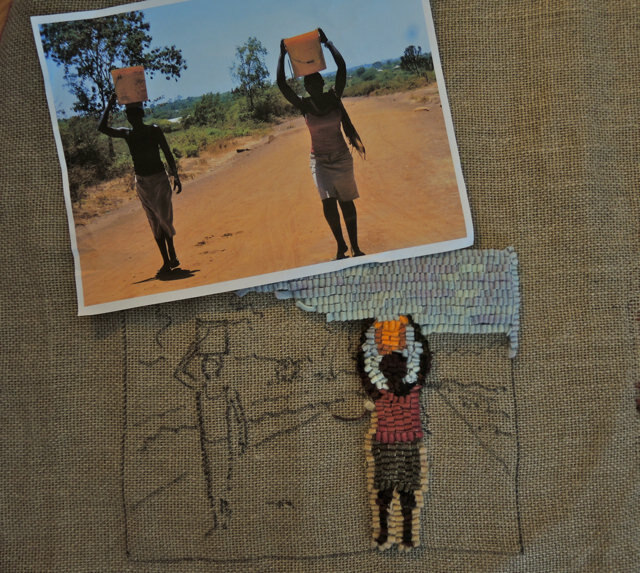 I am going to Kenya for a month to work with the local women on rug hooking. This is my fourth year in the village and my third year working with the women. I have a suitcase crammed with woollen worms and dyed pantihose and a few pieces of backing but hope to buy a bolt of backing in Nairobi as well as more clothing and jersey which can be cut in strips. If the project is going to be self-sustaining, it will be important to source the materials there. I’ve been doing a little hooking in preparation. Some of the women became very proficient last year, and will be ready to go on to their own projects and designs. Others will be joining the group for the first time and will work through the practice pieces. 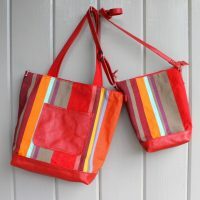 Both both groups will produce small pieces which we will hope to sell. 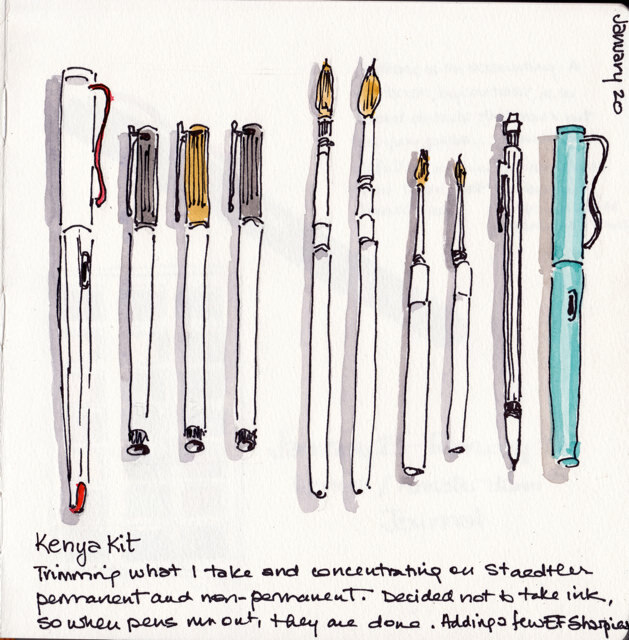 Kenya is also a wonderful place for sketching and I intend to do as much as I can. I am paring down my kit into something that I can carry with me at all times in a small backpack. Since I will be away for a month, I need to take enough to last–so I have stocked up on Staedtler permanent and non-permanent markers–I have grown to like these very much –as well as the trusty Micron 05’s. I’ll take a couple of my favourite Lamy pens as well. 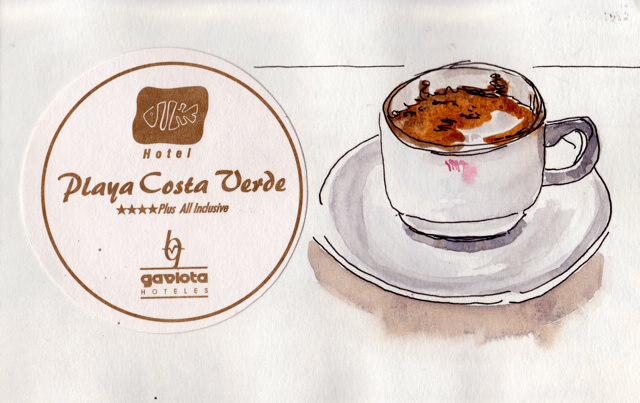 And a final cup and saucer sketch. We were at my favourite café and the server heard my cough and raspy voice. Knowing I was going on a plane this weekend, she brought over her special ‘tea for colds’–lemon, cloves and honey. 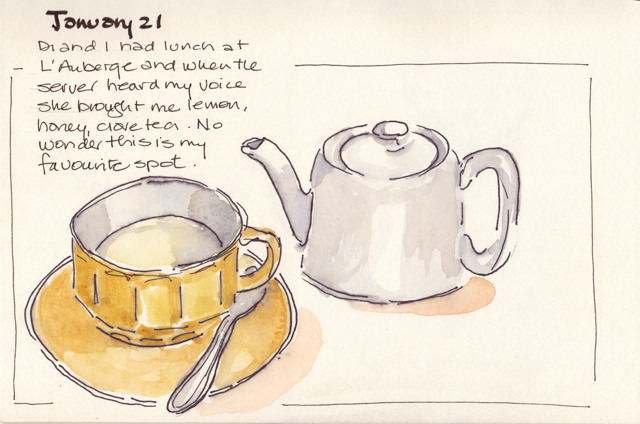 We were sitting in the window table, my favourite, and the tea was delicious and soothing so I celebrated the moment with a quick sketch. 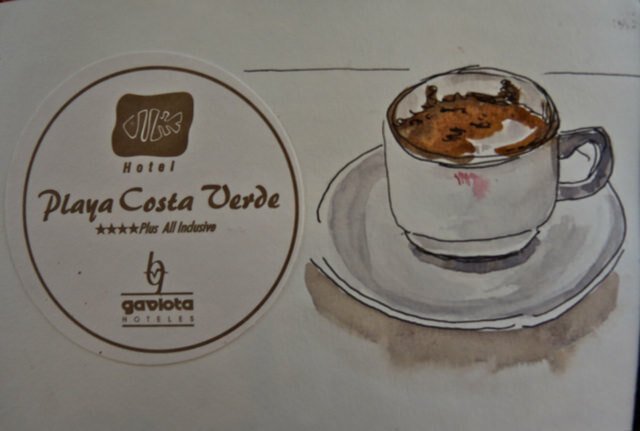 Yes I do love those yellow cups, but note for next time–include more of the surroundings in the sketch…btw the sketch below is done in my current sketchbook, Stillman and Birn Delta Series. Although I love the 7″x10′ size and the coil binding, I am not fond of the ivory colour. Seen compared to the while of the one above, my Kenya sketchbook, the hand.book 8.25×8.25, I realize how much I prefer the white paper. I’ve been keeping journals almost all my life, since the red faux-leather one with the lock that I got for Christmas in Grade 8. My friend A still has all her old journals dating that far back and pasted in them are notes we sent each other over the aisles in the grade 8 classroom and much much more. Unlike A I have long since trashed those early journals and many subsequent ones. But I started keeping an illustrated journal in 2009 when I discovered Danny Gregory’s book Creative License. And since then, I have been recording regularly, refining my sketching and notes and working out an approach and a style that is comfortable and sustaining. I’m thinking about all this because I’m heading off to Kenya and then Amsterdam and I want to use the journal to record as much as I can of my experience of those amazing places. Coincidentally, Ian Brown, has an article on keeping a personal notebook in today’s Globe. He says a notebook “is to record details that reach out as you pass, for reasons not immediately apparent. A notebook is full of moments from days that have yet to become something…I like to read my previous year’s notebooks…and from those fragments I gather a sense of the time that poured by. 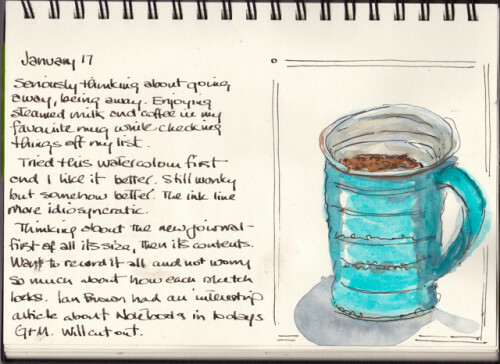 It’s never what I remembered or planned.” Brown is talking about written notes, but his comments apply equally to a sketchbook. Your sketchbooks record what literally ‘catches your eye’ and give a rich sense of your days. 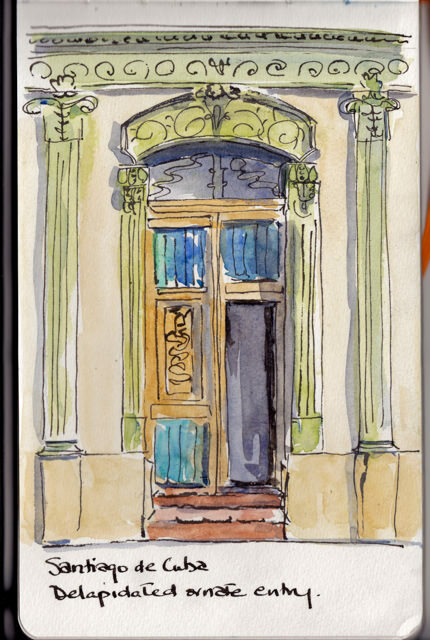 For the new 2015 travel sketchbook, I plan to concentrate on volume rather than striving for that perfect sketch. I want it to be full of thumbnails and random thoughts and quotations from what I am reading. Ironically that is what the 2009 sketchbook contains. Lots of things cut out and pasted in or copied. 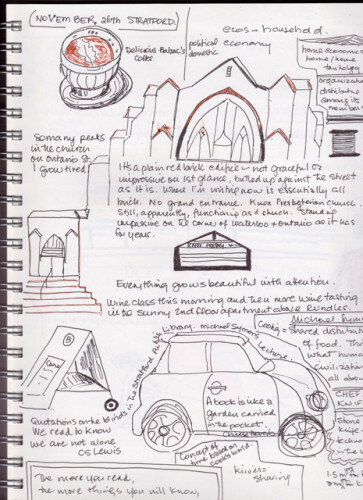 The sketches are basic and tentative but the content gives a rich sense of my days. Over the five years since then I’ve worked on sketching but with my main focus on improving the sketch, I have often left out the things which make the record rich. It was a beautiful Ontario winter day today and I had a half hour to spare. So I parked in the Court House parking lot and set up my sketching kit in the front seat of the car. 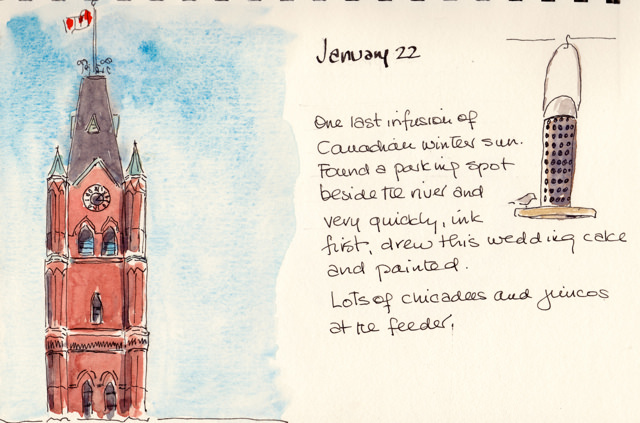 Although it was a beautiful sunny day, it was still -7 C, too cold to sketch outside. This is the east end of one of the most delightful buildings in Belleville, the Bellevue Terrace, a series of six three-storey townhouses, built in 1876. When I first moved to Belleville, this was the place I wanted to live. Sadly I have never even been inside one of the units, but have always admired the ‘Eclectic High Victorian’ design, especially the concrete window hoods and sills. And in a city that does not value its history, we are so lucky to have this terrace, protected by the Ontario Heritage Act. 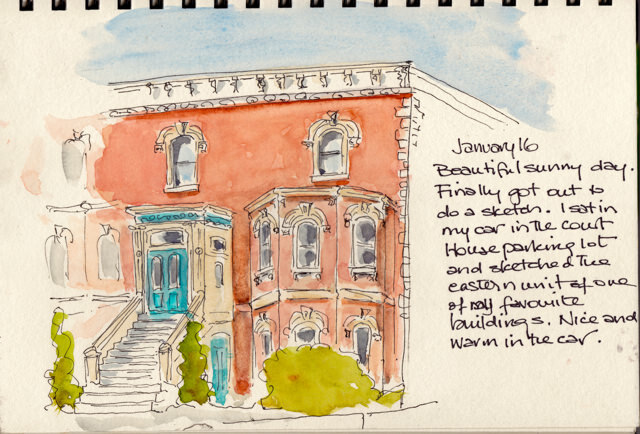 Earlier in the week, I started a quick sketch of the old Napanee Post Office from the parking lot of Mac’s Milk. I want to take the time to do justice to the whole of this wonderful sandstone building which was designed by Thomas Fuller, Chief Dominion Architect from 1881 to 1896, whose firm designed the centre block of the Parliament Buildings in Ottawa. The post office was built in 1887 and its over-budget final figure of $52000 was the subject of a federal investigation. But we have this glorious piece of architecture today, whose exterior as well as some of the interior features are also protected by the Ontario Heritage Trust. 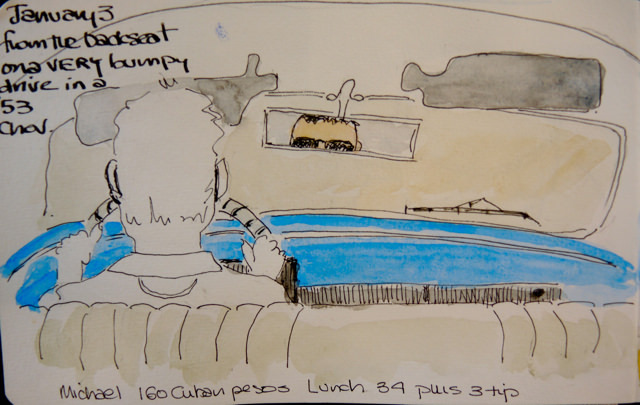 On Saturday we climbed into the 53 Chevrolet taxi again and headed for Holguin. 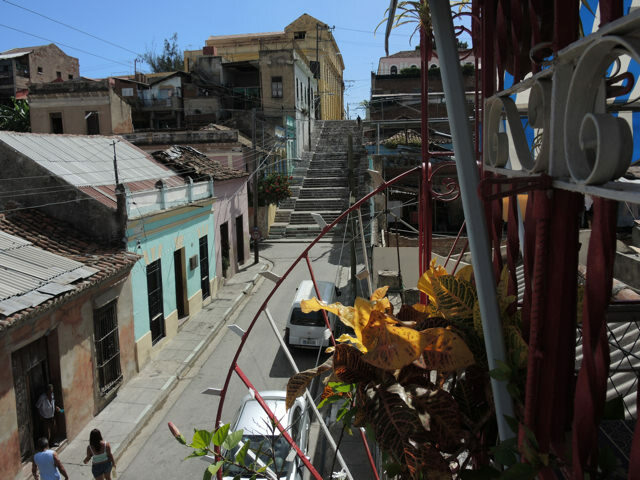 On the way we stopped in Santa Lucia, a small town and the former site of Sanchez Sugar Mill. The mill has been out of production for the last fifteen years, but the promenade with its ornate fence and benches still overlooks the mill buildings. As we walked along I was taken by the pastel buildings and by this one in particular, with its large B. I would love to know the story. 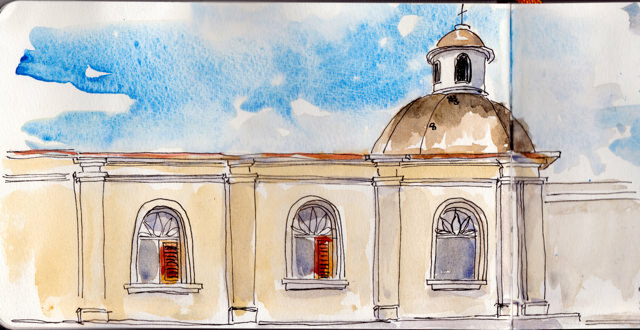 In Holguin I sat in two leafy squares or parques and sketched the bordering buildings. 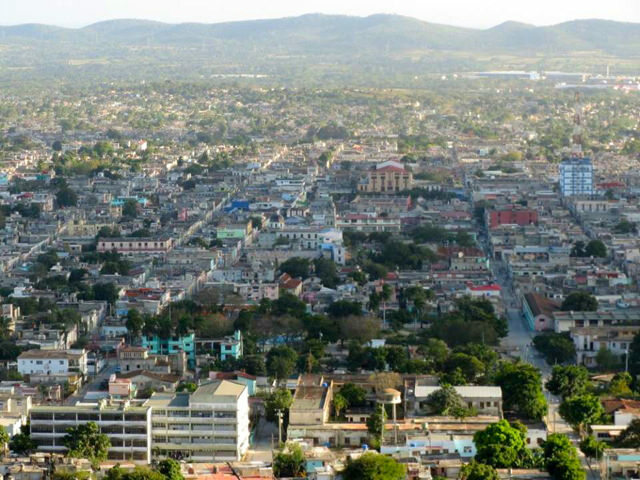 And before we left we climbed the Loma de la Cruz for a panoramic view of Cuba’s fourth largest city. 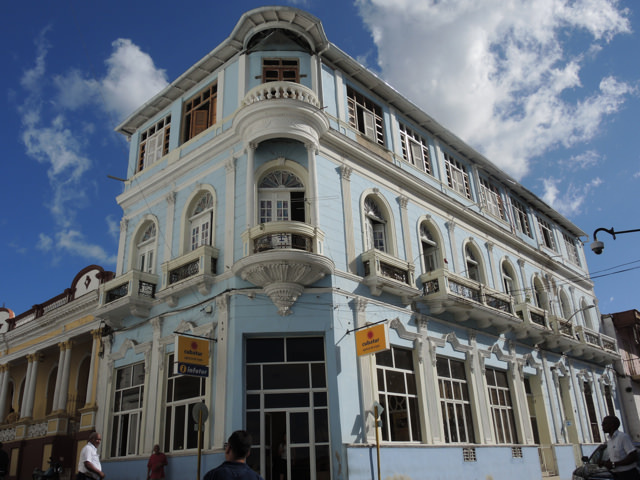 The major buildings in the centre of Santiago de Cuba were getting a facelift, but the streets around the square had an aging neglected beauty. 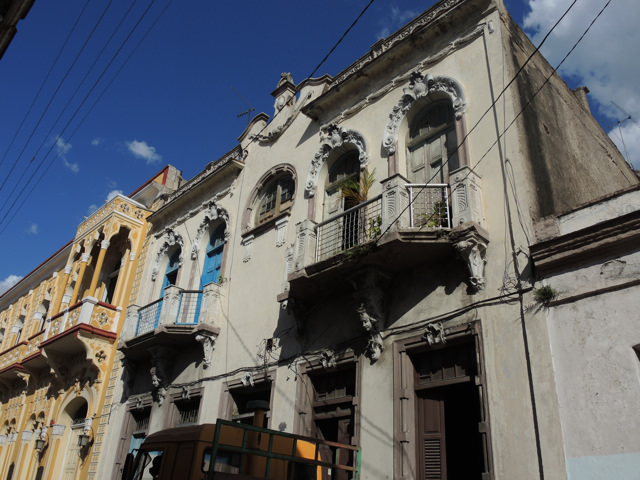 Their once grand cornices and carvings were faded and patched. I loved this doorway even though only one of its original door panels remained. I’ve owned a Sailor pen for a long time, having ordered it at some point on a whim, but it was only in Cuba that I started to use it. And the more I used it, the more I liked the unpredictability of the line–the skips, the blobs, the thick and thin. 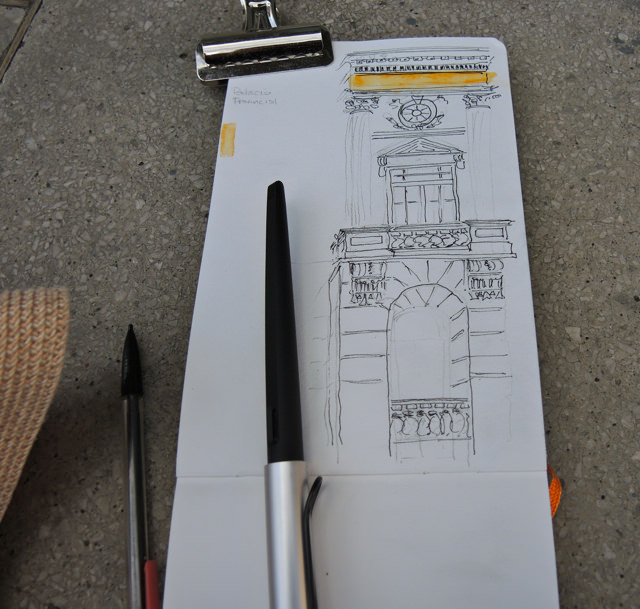 I wish I had had more time to sketch in the city; there was something intriguing around every corner. But before we leave Santiago, here are three photos which capture the flavour. The first was taken from the balcony of the casa where we had lunch with a view of the Padre Pico stairs and the next two highlight the rich colours and the details. And now that I am back in below zero temps, I can’t help but look longingly at that sky. 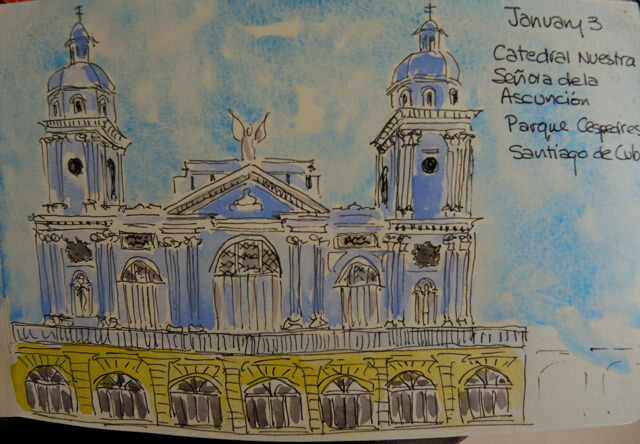 When I was away in Mexico, the family made plans for us all to celebrate the New Year in Cuba. My older son and his partner were cycling in the eastern part of Cuba for their two week break. They invited the rest of us to stay a week near their route–including 17 month old Louis–so we could all be together for New Year. 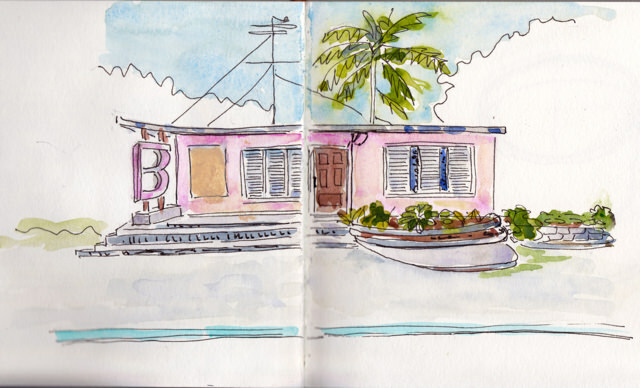 Although I was not planning to head south again so quickly, (especially as the Kenya trip looms on the horizon), the week turned out to be wonderful both for family and for sketching. And it was certainly a nice break from the -20 temperatures at home. Although we like the beach, the best part of these holidays is exploring the local towns. 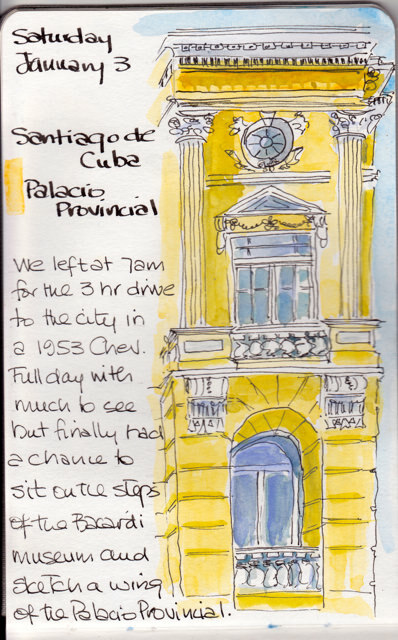 So we hired a taxi for the 3 hour ride to Santiago de Cuba and were delighted when Michael arrived with his 53 Chev (with Hyundai diesel engine). 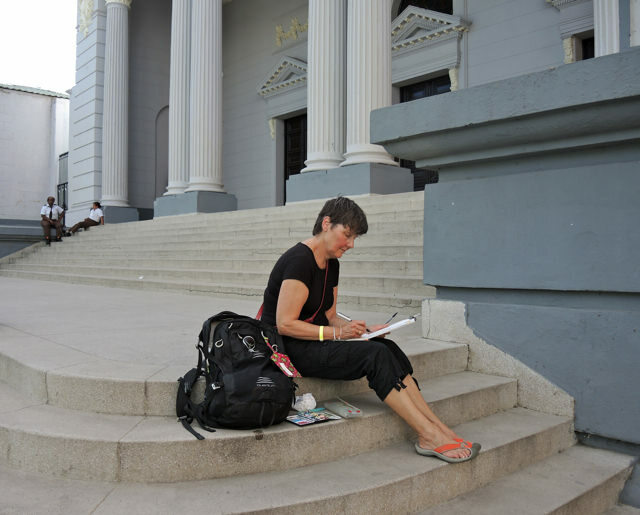 We toured some of the churches and monuments to the revolution before entering the city proper. Then we had lunch in a casa at the base of the Padre Pico Stairs and from there walked the city centre from parque to parque. There wasn’t a lot of time for sketching, but I did manage two. 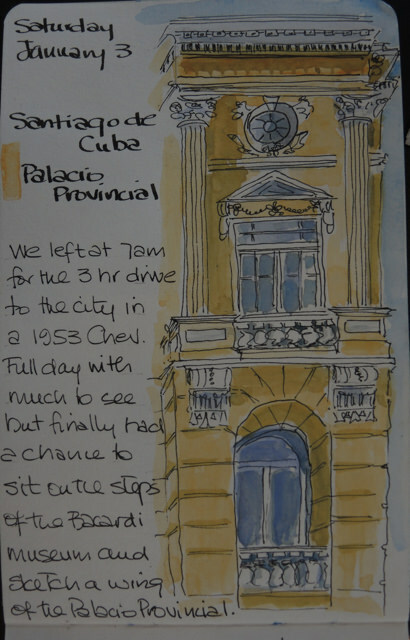 For the first I sat on the steps of the Bacardi Museum and sketched one wing of the newly refurbished Palacio Provincial. 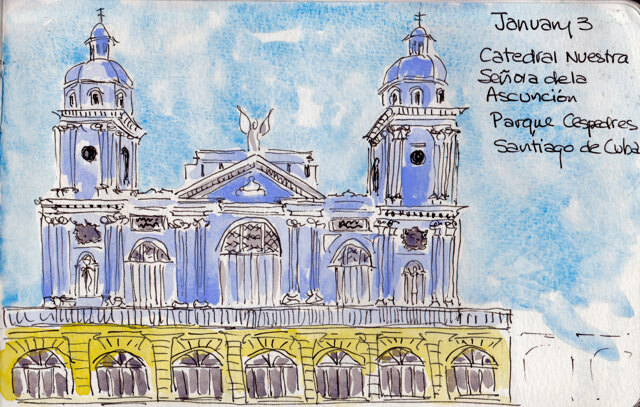 And then a quick sketch of the Catedral Nuestra Senora de la Ascuncion in the Parque Cespedres. They were still restoring this beauty.